Villa Pocelje a beautiful view of nature and sea. Property 3: Villa Pocelje a beautiful view of nature and sea. Property 17: SPECIAL OFFER! Perfect sea view apartment with private and heated pool!!! Property 23: Sunny apartment only 10 m from the sea! Property 28: Apartment near the BEACH with beautiful SEA VIEW! Property 29: Serena apartment, with sea view, close to the pebble beach! Property 35: Apartment 2-4 persons, heated pool, garden with sea view and fitness. Wonderful apartment, very accommodating and friendly people, great location! We thoroughly enjoyed our stay in Podstrana, our host was very kind and friendly, he walked through the apartment showing us where everything was and also he walked with us around the area making us familiar with everything nearby. The apartment was upscale, it had everything we needed, it was spacious, modern and very nice. The location was perfect, just one block away from the marina. We grilled on the BBQ one evening and all the cookware and serving ware we needed to prepare our meal were provided in the kitchen. We inquired about staying an additional night and our hosts were gracious in extending our stay in their apartment! We give them a 10 star review! My husband and I and our two friends from Germany so enjoyed our stay in Villa Karmela. Boris was very prompt in answering my questions before we arrived. And he and his family made all 4 of us feel very welcome during our stay. The villa was very clean and well equipped. There are a few steps to get to the villa, but a railing was installed for us to more easily navigate the steps. 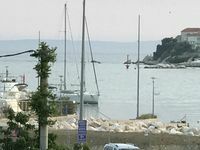 The view from the patio deck was beautiful and we all spent many hours there enjoying the views of the Adriatic! It's such a beautiful area and everyone we met was friendly and informative. It was a wonderful visit to a very interesting area. We all came home with great and special memories. Thank you, Boris, for all that you did for us!